TransferWise is yet another purely Internet based international remittance service. Whereas the Silicon Valley based Xoom entered the industry to compete with Western Union at providing money transfer service for immigrants or migrants in the US, the UK based TransferWise started by attracting globally mobile professionals who move frequently within Europe and to the US for better job opportunities. The divergent beginnings of the two companies mean that they have very different approaches to the service they provide. Xoom generates most of its business between the US and developing nations and focuses on convenience and speed, while TransferWise serves price-conscious white-collar professionals who want to move funds between their accounts in different countries. TransferWise’s only value proposition is that it is cheaper than everyone else. So how does TransferWise achieve this? The founding story of the company gives away a few clues. In essence, TransferWise matches the aggregate volume of the transfers it processes between any two countries. The best-case scenario is if the transfer-in and transfer-out volume is exactly the same, then it does not actually need to exchange currency and transfer any money. All it needs to do is pay out the transfers from its local accounts to its customers in either country. For example, on the day you transfer $2,000 from your US account to Germany, there is another guy in Germany who wants to transfer roughly €1,560 to the US. 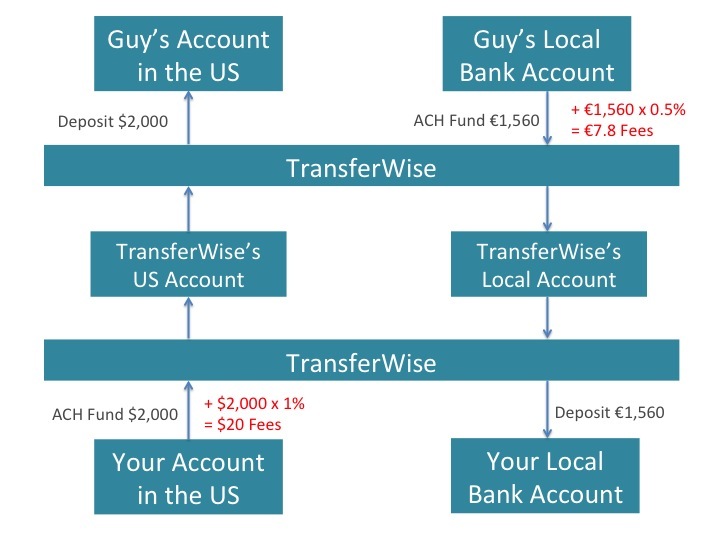 Instead of actually going through the inter-bank system to make transfers, TransferWise pays the $2,000 it received from you from its US account to the US account of the person in Germany, and pays €1,560 from its Germany account to your Germany account. It is as if you and the guy in Germany are friends, and have an agreement to deposit into each other’s accounts according to the fairest exchange rate for both parties. This way only domestic transfers are required, which are much faster and cheaper than international transfers. See the illustration below. In fact, this is TransferWise’s pricing model. It uses the mid market interest rate so it is not making money off exchanging currency for you. However, since you and the guy in Germany don’t know each other, it charges a flat fee, depending on the size of the transfer, from each of you to provide this service and make a profit. It is a more consumer friendly pricing model since you know exactly how much you are paying for the service, no matter what the exchange rate is. The flip side is that TransferWise’s customers take on more currency risks, while most other service providers usually post one conversion rate per day and may stand to lose money or profit from the intra-day currency fluctuation. (TransferWise does provide a way for consumer to mitigate some of the currency risks.) By cutting out the inter-banking system, for the most part, TransferWise becomes the middleman who is able to cut costs, and willing to cut prices, drastically. Since TransferWise does not charge a premium on the exchange rate, it does make it hard for you to compare the final cost of the transaction using TransferWise versus other services. Here is a simple way to help you determine which service is cheaper according to each company’s website estimates on transferring between a US bank account and a Euro account in Germany on October 8, 2014. Basically you need to know how much you are putting through the company’s “blackbox”, and how much is coming out. The input is how much your US Bank account will be deducted (including fees), and the output is how much your Euro account in Germany will be credited (including an exchange rate premium.) The larger the number means that the “blackbox” takes away less, which means it is more cost effective for you. So TransferWise is indeed cheaper, supporting its best price guarantee. However, it is only barely cheaper than Xoom. Since the TransferWise does not guarantee exchange rate, it is possible that when your transaction goes through, the exchange had fluctuated against you. In such case, Xoom can become cheaper. You can try to make the same comparison using other countries and amounts. This concludes the International Transaction 101 series for now. I hope that these posts have been beneficial. Click here to catch up on all the past posts in this series. If you find other international transaction types that you would like me to cover, just leave a comment! Thanks! You have listed some great options for moving money internationally in your blog. Personally I prefer using such peer to peer transfer options as Transferwise. As you note in the article, different services are designed for different purposes. Therefore, it is good to know which has the best conditions for a certain destination or currency For transfers in Europe there is also Paysera – convenient option, as it includes majority of European currency and usually offers good exchange rates. From my experience, transferring Euros with Paysera was even cheaper than Transferwise. There are list of money transfer services available online. I usually read online reviews or ask expert advice from my friends who had done transaction earlier. Your article is also nice. I will definitely give it a try.